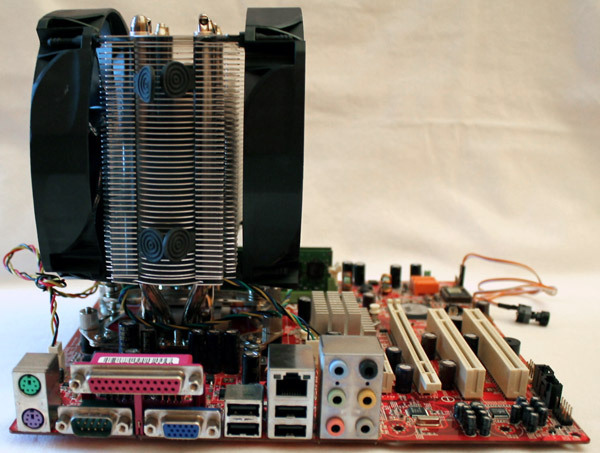 The Xigmatek SD1484 is a big player and currently one of Xigmatek's biggest single tower cooler. My cooler sample was delivered with two 140mm fans. 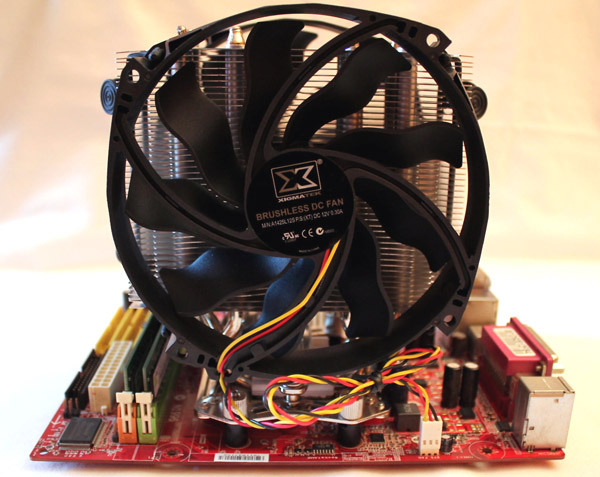 - holding bracket for AMD and Intel systems. 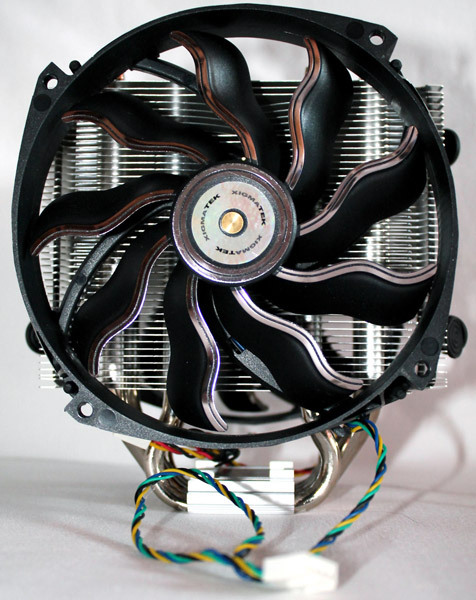 The cooler has 4 copper heatpipes, which end in a aluminium cooling block with fins. The Heatpipes have direct touch to the CPU. The mounting must be done before you set the mainboard in the case, because of the cooler weight (with both fans 1,08 Kg), so the cooler is screwed to the motherboard. 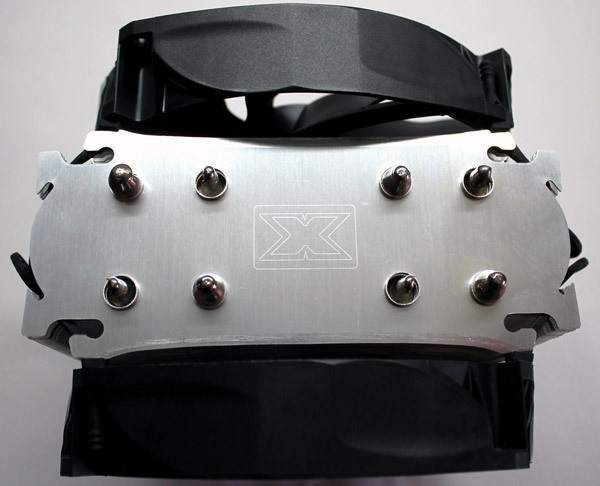 Before you begin the mounting, you must remove the original back plate and it doesn't matter if you have an Intel or AMD based system. Then you must configure the right plate for Intel or AMD system, on which you install the cooler. You have to must remove both fans before you install the cooler, because you can't reach the screws afterwards. 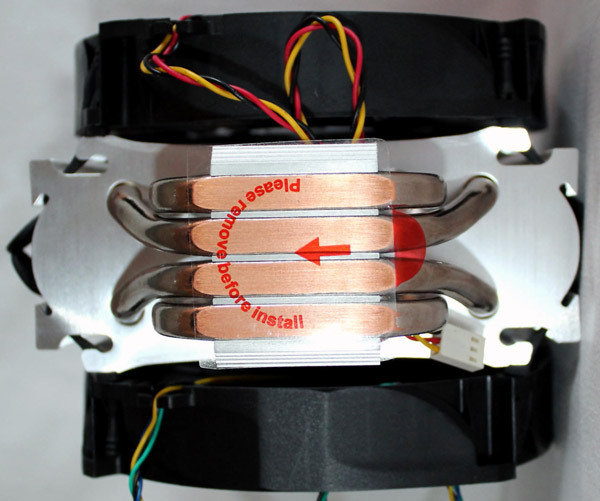 But this is very simple, because the fans are fixed with rubberbands to reduce the noise and vibrations. The ambient air temperature at all tests was between 20.4 °C and 22.4 °C. I have run all tests with the adjusted clock with one and two fans. The Xigmatek SD1484 PRIME is really a big player. 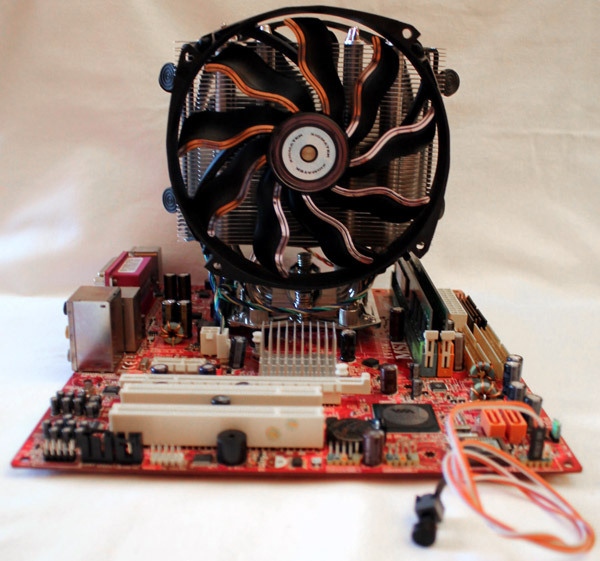 The cooling power is very good. My personal feeling about the noiselevel is good as well. Compared to the Cooler Master Hyper Evo TX3, I think the noise was a little bit lower. What probably is caused by the bigger 140mm fans, the special waveform of the fanblades, and in result of that the lower rotation speed. The cooling power was good enough on my test platform, even only with one installed fan. The mounting is a bit tricky, because of its overweight , you must screw it to the mainboard. And you have to be very careful at the mounting, that you don't hit parts of the mainboard. The case should have enough space, because the cooler measures 18cm from the mainboard to the case side. 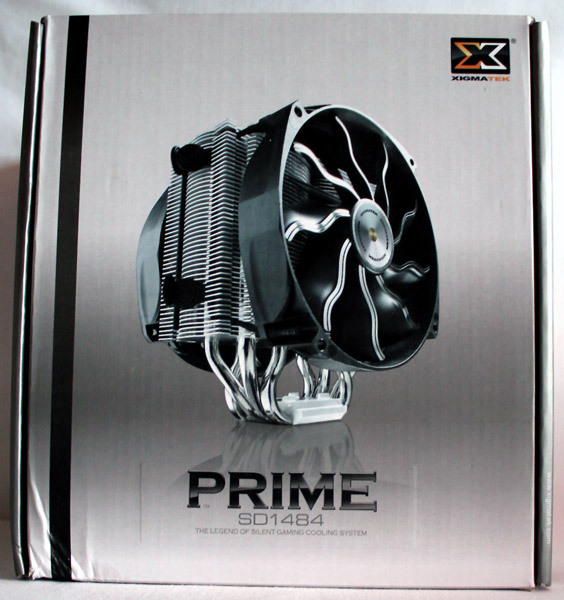 Overall the Xigmatek SD1484 PRIME is a very good air cooler, which is also excellent suitable for overclocked systems. 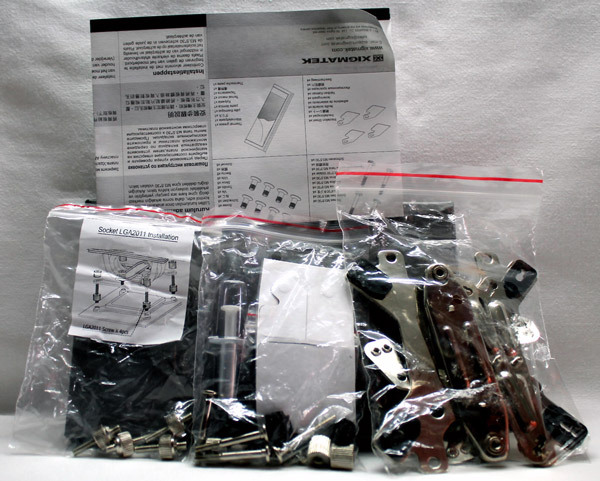 The shipment includes all you need for mounting and the fans are fixed with rubber bands to reduce noise and vibrations. And you can buy the cooler at this time for 46 EUR without shipping and handling. 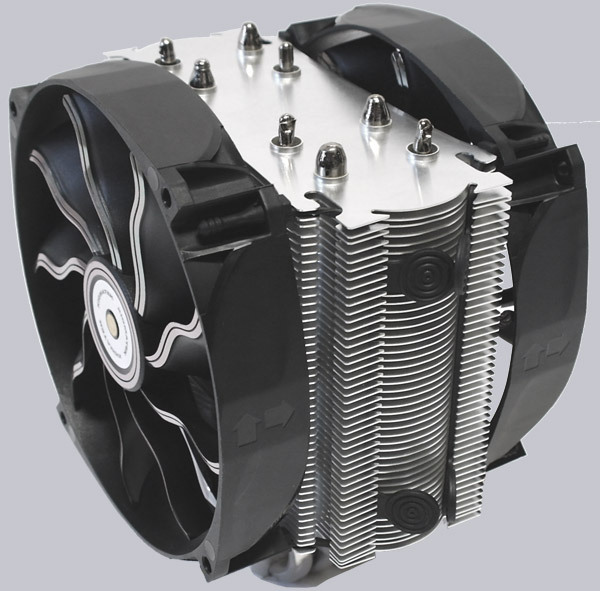 Here you can buy the Xigmatek Prime SD1484 cooler. My personal conclusion: Very recommended !!! 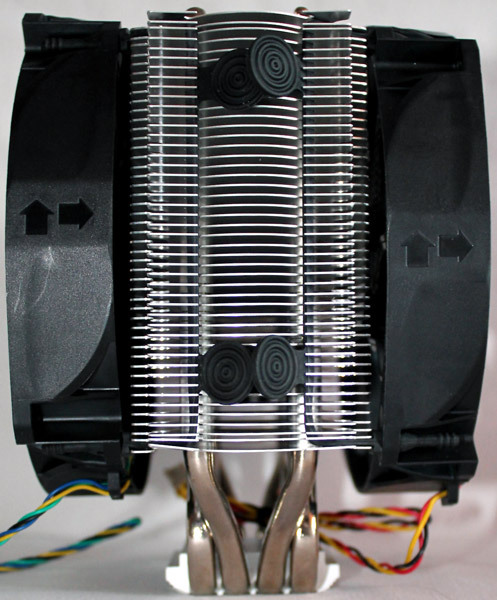 PS: When it's getting too hot for you at the summer, you can build a very stylish 12V air condition ^^, because the Xigmatek Prime has a very strong airflow . Here is the interactive Fit for Fan guide with the cooler sounds.